Baumann-Wohlenberg presented their N° 2 cutting system, which offers high flexibility for medium cutting volumes, at DRUPA 2012 already. Now, the company has launched a cost-favourable "light version" of this system which consists of a BSH pile hoist, a BSB L professional jogging machine, a system for automated front tabel feeding (BAVB), a Wohlenberg high-speed cutter as well as a BA / BA N unloader or a BSH-W pile hoist. 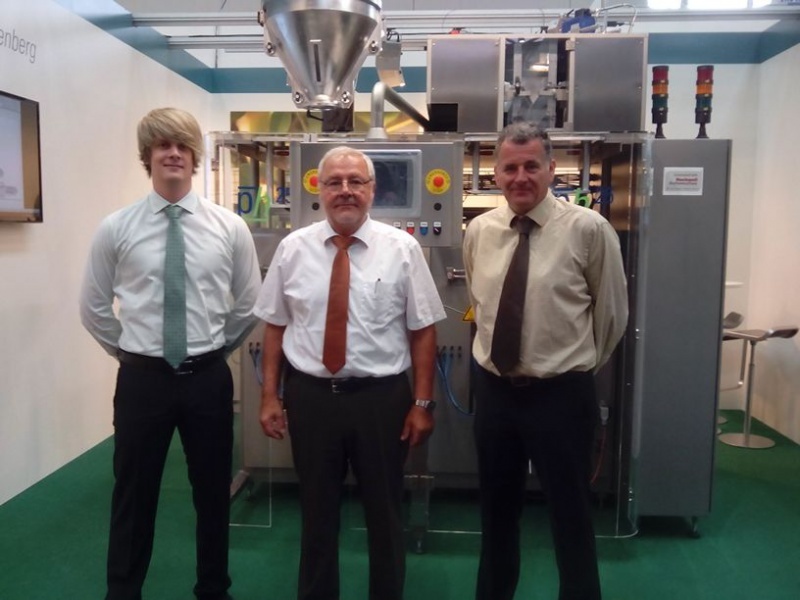 During this year's Interpack, the two buisness partners, Baumann Maschinenbau Solms and Hahn Automation GmbH, presented their mutually developed vertical form-fill and seal machine for the first time to a wider public. 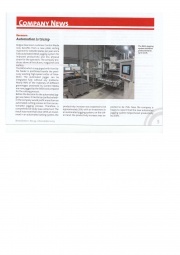 Baumann-Wohlenberg have extended their range of products by the restacker AS-1000. 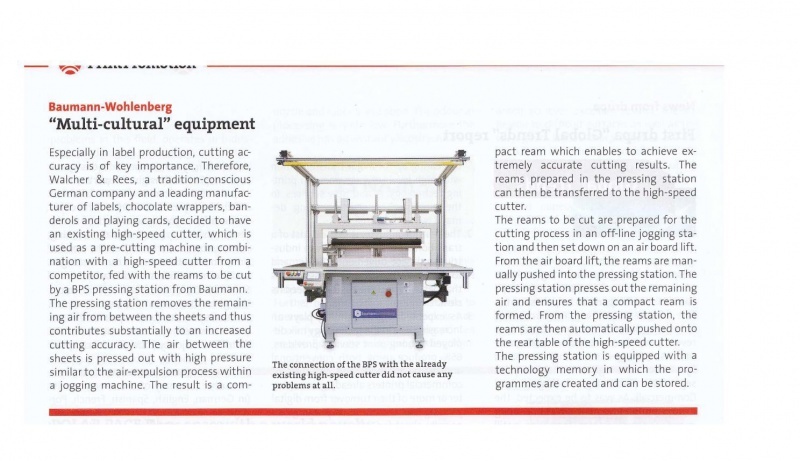 It is related to the Baumann pile hoists, but has been especially designed for use in combination with perfect binders, stitchers, gathering machines or cutters. 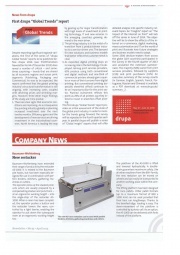 Especially in label prodcution, cutting accuracy is of key importance. 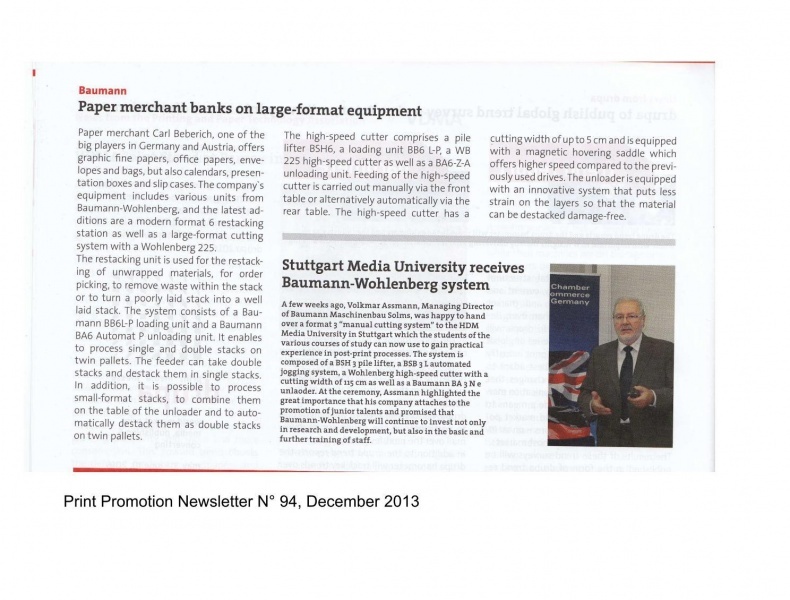 Therefore, Walcher & Rees, a tradition-conscious German company and a leading manufacturer of labels, chocolate wrappers, banderols and playing cards, decided to combine an existing high-speed cutter with a BPS pressing station from Baumann. Paper merchant Carl Berberich, one of the big players in Germany and Austria, offers graphic fine papers, office papers, envelopes and bags, but also calendars, presentation boxes and slip cases. 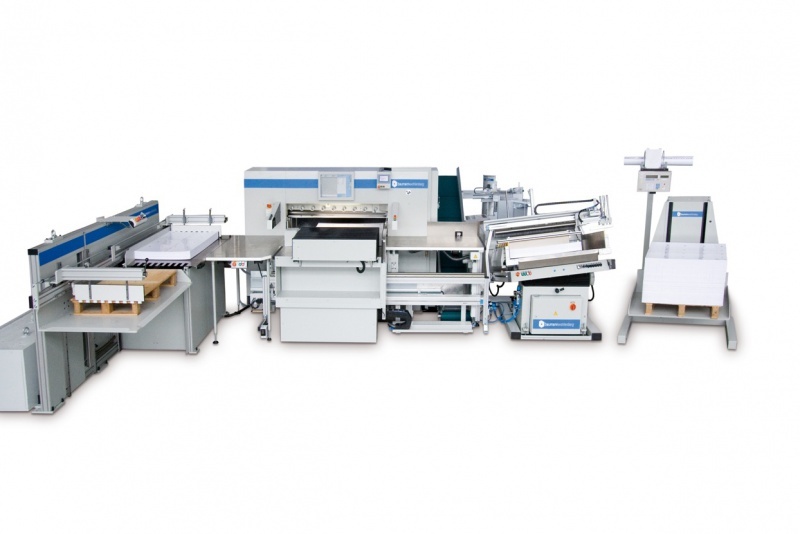 The company's equipment includes various units from Baumann-Wohlenberg, and the latest additions are a modern format 6 restacking station as well as a large-format cutting system with a Wohlenberg 225. Belgian Baumann customer Control Media now benefits from a new plate sorting machine for 100,000 plates per year and a fully-automated BASA jogging system for improved productivity.